Gary Welsh over at Advance Indiana, posted some really important information the other day. I feel it is so important that I should post an echo of it here. In "Rebuild Indy 2 Should Easily Cover the Cost of Mayor's Re-election Campaign", Welsh reports that a reader provided him with an analysis of Mayor Ballard's campaign finance reports and construction companies who received any of the Rebuild Indy money. All construction company contributions, including the personal contributions of company principles, between 2010 and 2013 were tabulated. The list was cross referenced to a list of all contracts awarded for Rebuild Indy. The top ten campaign-contributing companies just happened to get no-bid contracts for Rebuild Indy work during that same time period. Let me say that again - the top ten construction company contributors to Mayor Ballard's campaign, all just happened to get no-bid contracts for Rebuild Indy work. A no-bid contract is awarded without any competition to ascertain the lowest and most responsive bid for a particular project. It is just awarded to the chosen company straight out. If you are counting, the top ten contributors got $78,274,421 in no-bid Rebuild Indy contracts and fattened the Gregory Ballard for Mayor Committee coffers by $706,905. For more analysis, I refer you to Welsh's excellent piece. When you go to the polls next Tuesday, May 6, you'll have lots of folks ready to hand you a glossy photo array of their Party's slated candidates. Harder to find is a list of those candidates on the ballot who are not slated by the Parties - either because they did not pay the slating fee (most of them) or were not the selected slated candidate. There are a smattering of these folks appearing on ballots throughout Marion County. This list was compiled by comparing the names listed on the Marion County Democrat and Republican Party websites, and names of those who filed to be candidates at either the Secretary of State's Office or the Marion County Election Board. Not long after my last blog entry went live (see "Maggie Lewis' Curious Campaign Finance Reports"), an alert reader made me aware of the curious nature of City-County Councillor Brian Mahern's latest campaign finance report. The purpose of campaign finance reporting is simple transparency of who gave how much, and where it went. To ignore that, or worse to have something to hide, is not "Better Government". With non-disclosure, the public is left to wonder why. I have a great deal of respect for Mahern; respect that grew gradually as I saw him take one stand after another that demonstrated an expectation that government work for the benefit of the people. That respect does not evaporate with this one omission. But, this one omission does sadden me. All of Mahern's earlier campaign finance reports itemized contributions. Whether Mahern took a 'screw them' attitude, couldn't locate his ledger containing the donors' names, had something to hide, or something totally different - I do not know. Unless the online Election Board listing is somehow incomplete, this is one time Mahern did not hold the public interest in high regard, and that mars his record. I was scanning recent campaign finance reports of some of our City-County Councillors as part of my background for the Kidde smoke detector blog entry ("Will Passage of Prop 364 Give Monopoly to Smoke Detector Company?"). I didn't see any contributions from Kidde or its parent company in the few reports I reviewed. However, I did see a goodly number of curious expenses reported by the "Maggie Lewis Campaign" for 2013. For those who don't know, Lewis serves as the President of the Indianapolis-Marion County City-County Council. These expenses were curious for two reasons. One, they were paid directly to Maggie Lewis with no reason for the expenditure noted. Two, they were always whole dollar figures. A person might expect to see 'reimbursement for expenses' and/or an indication of 'so many' dollars and 'so many' cents being paid, implying the expense was backed by receipts. These 13 direct payments to Lewis totaled $5906 in 2013. In 2012, Lewis' campaign finance report noted two direct payments and eight payments with "payment of debt" noted. There was no mention of any debts owed by the campaign to Lewis in any previous finance report. There wasn't even any contribution by Lewis to her own campaign noted in any finance report. The 2012 direct payments totaled $200. The "payment of debt" payments to Lewis totaled $2759. Reaching back to 2011 we finally get to non-whole numbers as well as notes explaining the payments to Lewis. Coded for advertising, a payment of $264.01 was reported. Another payment to Lewis for $353.58 had the note, 'food reimbursement for fundraiser'. Reported for later in 2011, though, were two payments to Lewis totaling $1000, for which no reason for the expense was provided. Campaign finance reports for 2009 and 2010 show no payments to Lewis. So, over three years, the curious payments to Lewis by her campaign were $1000, $2959, and $5906, coming to a grand total of $9865 even, no cents. Still, I don't pour over campaign finance reports much; this might be something usual. So, I went through the 2013 annual reports from all sitting Councillors. Two, Shreve and Gooden, were appointed during the term and have yet to file campaign finance reports. If a Councillor's 2013 report showed no expenses whatsoever, I went through that Councillor's reports until I reached a year during which there were itemized expenses. 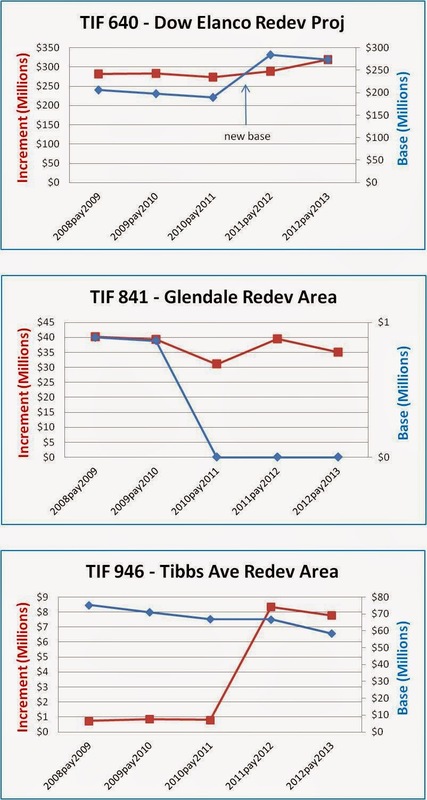 For two Councillors, Talley and Brown, I looked at their campaign reports for 2013 for their runs as Trustees, as well. The vast majority of Councillors didn't pay themselves a penny in the reports I reviewed. There were four exceptions besides Lewis. Minority Leader McQuillen, whose campaign in 2013 paid him $2961.80, all noted as 'reimburse expenses' and all noted with dollars and cents. The Talley For Trustee campaign reported a single $461.83 payment to Talley and noted 'reimburse campaign expenses'. Hunter's campaign reported two payments totaling $170 to a Keri Hunter, with explanations noted, and a $100 direct payment to Hunter himself, with no explanation. Cain's campaign paid her $30 in 2013 with no explanation. So, of 29 Councillors, two have no campaign finance reports filed, 22 have no payment to themselves in the most recent filing that includes itemized expenses, two have payments with explanations, and two have one payment to themselves with no explanation, and then there is Lewis. Lewis' campaign payments to herself are curious, and stand out among her colleagues, especially in their amount. Will Passage of Prop 364 Give Monopoly To Smoke Detector Company? Philosophically, how do you feel about a law being enacted that was written by a lobbyist in such a way as to award his client a virtual monopoly on their product? Well, such a law may come to pass if Prop 364, 2013, is enacted by the Indianapolis-Marion County, City-County Council. Wednesday night the Public Safety Committee will consider adding a few lines to our Ordinance regarding smoke detectors. This is the second go-round for the Committee on this proposal; it having been sent back to committee at the urging of Committee Chair, Mary Moriarty Adams due to "new concerns [having] been raised by her colleagues". Prop 364 was written by Scott Chin, partner in Faegre Baker Daniels, LLP, and registered lobbyist for United Technologies, Corp., parent company to Kidde. Kidde designs and sells smoke detectors, among other things. Kidde has thrown some high power at Prop 364. In addition to Chin, other FBD Partners J. Murray Clark, Frederick (Chip) Garver, Mindy Westrick Brown, and Joseph Smith all registered to lobby the City for United Technologies in 2013 and 2014. Only Smith registered to lobby for other clients. Kidde was granted US Patent 7,525,445 in 2009, and it would be valid until 2023. It claims, in part, a battery that by design of the smoke detector, is not removable and not replaceable. If the Council changed the language to "tamper resistant", other smoke detector manufacturers' products would fit the proposed ordinance. If it dropped the extended battery life to 6 years, even more would qualify. In an email to members of the Public Safety Committee, one apartment owner claims that a lawyer for local law firm called and said the manufacturer would provide free smoke detectors to any apartment company that supports Prop 364 and helps get it passed. Kidde has given IFD free smoke detectors - a practice one hopes is not connected to passage of this ordinance. Scanning a FEMA report on smoke detector laws in various states, one sees a number of fire safety laws that have been enacted in a goodly number of jurisdictions. Is hard wiring, especially in new construction, being proposed here? Nope. Is there a requirement for a 'hush' button, especially if the detector is installed in a kitchen? Nope. All there is in Prop 364 is what the lobbyist put there. Beyond all this, there are other problems with Prop 364. For instance, there is no easing into the implementation of this Ordinance. On July 1, 2014, precisely, the new law would take effect. You would have to replace all of your smoke detectors by then or be in violation. Given that the cost of these extended life devices is greater than the basic one-year battery type, this can be hundreds of dollars. Apartment owners could have significant bills for new smoke detectors - an unplanned for 2014 expense that could be harmful to their business. Not to mention there is no time for retailers to get the non-compliant brands off their shelves via sales. The entire concept of an extended life battery is also open to debate. Just go to your favorite online retailer and scan the reviews. Certainly, paying more for a smoke detector with a claimed battery life of 10 years and getting only 2 months out of it would motivate you to write a negative review. Still, there is no study that I could find that compares the claims with real world testing. I have no objection to trying to improve our fire safety laws. But, I would prefer changes that begin with those that would make the biggest difference first - like requiring hardwiring, photovoltaic and hush buttons. Any of these are more important than requiring non-removable, non-replaceable, 10 year battery operated devices (made exclusively by Kidde). 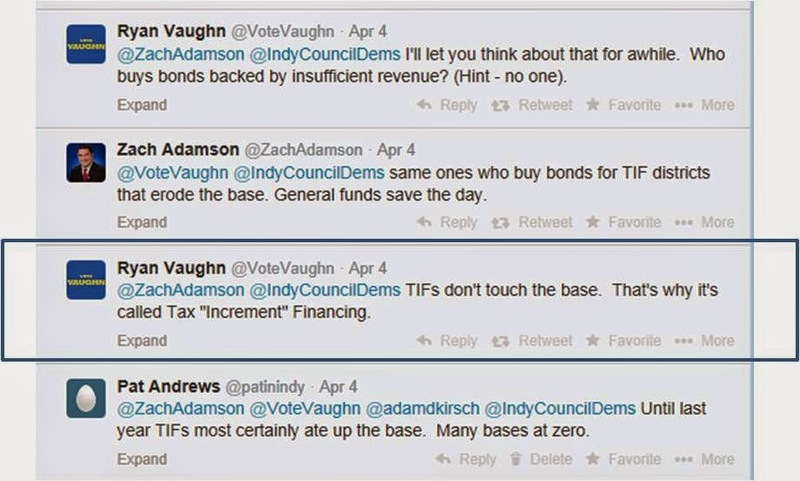 I was pretty taken aback when alerted recently to a Twitter exchange between City-County Councillor Zach Adamson and Mayor Ballard's Chief of Staff, Ryan Vaughn. Yes, Ryan Vaughn actually stated that "TIFs don't touch the base. That's why it's called Tax 'Increment' Financing." 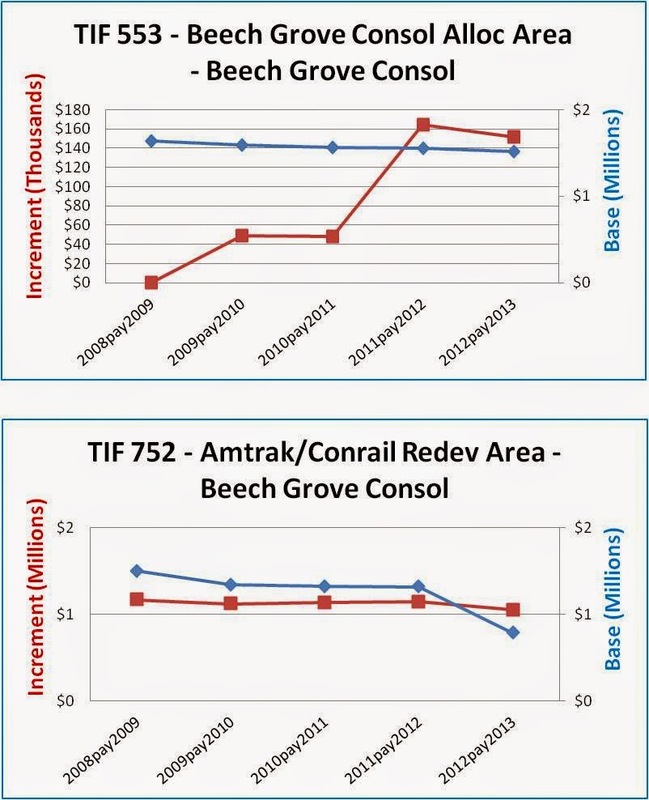 It is discouraging that someone so involved with spending our tax dollars, does not understand the difference between the promises made about TIFs and the reality. 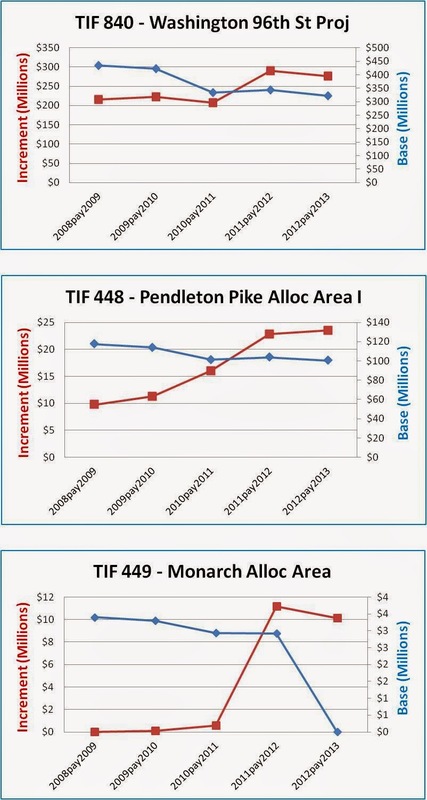 The erosion of the base was so prevalent in Indiana, that two years ago the Legislature enacted changes in how the base is recalculated each year (the TIF neutralization). I have obtained all of these forms for all Marion County TIFs from 2008 to 2013. 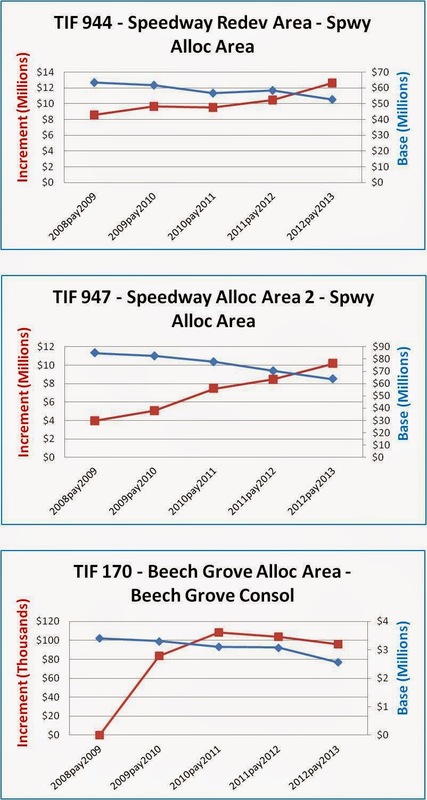 Below I chart the increment and base for all TIFs whose base was not already zero in 2008. 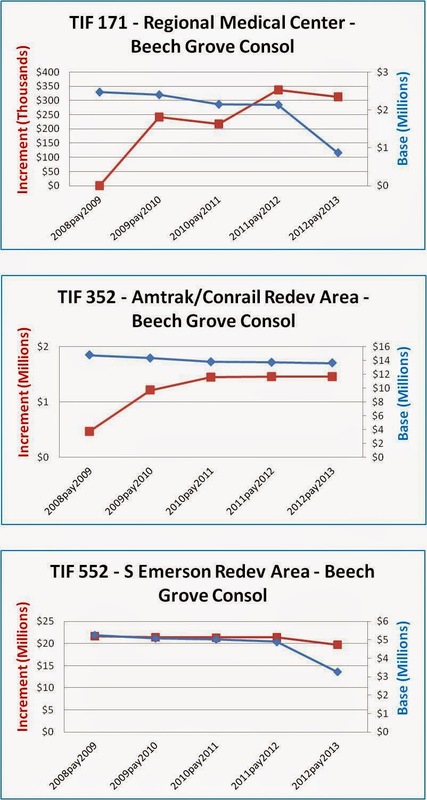 I did not include 2013 data because they grouped the TIF numbers - for instance, all the component TIFs of the Consolidated Downtown TIF are no longer reported individually. Suffice it to say, the new base recalculating method is most helpful in preserving the base. Assessments are done in one year, and the taxes are billed the following year on that assessment. Thus, the x-axis reports time in the format of 2008pay2009. The y-axis for the increment is on the left and increment is shown in red. The y-axis for the base is on the right and base is shown in blue. 29 TIFs had non-zero base in 2008. 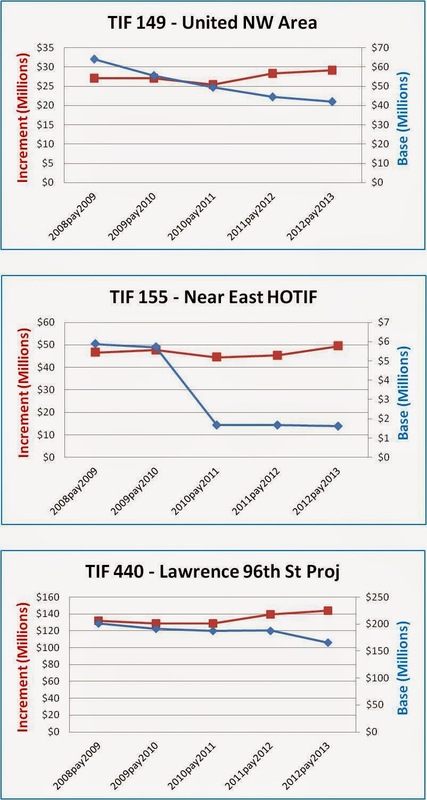 TIF 640 had been dormant before 2012, when it was reactivated. The base was reconfigured at that point in time. A long time ago now, the Marion County Alliance of Neighborhood Associations began following the City's annual budget based on one proposition. That proposition is that our elected officials can say lots of things, spin lots of yarns, and try to influence public impressions, but they will always put money into the things they feel are priorities regardless of what they say. Today we sit with news reports of yet more MILLIONS of dollars going to the Pacers and their billionaire owners - voted on by the CIB prior to public disclosure of the actual deal agreement(read Gary Welch's excellent piece on Advance Indiana for more). Our elected officials are prepping us for goodly increases in income taxes to provide more cops on the street - while saying violent crime is actually down, its just shooter's aim that has improved. Our elected officials will be looking to eliminate the local homestead credit - the third time for this push. Our elected officials will look for a calm moment within which they can place the mass transit referendum on the ballot to raise taxes even more - and you just know that the light rail boondoggle will somehow be included once again. But, where do we actually stand? 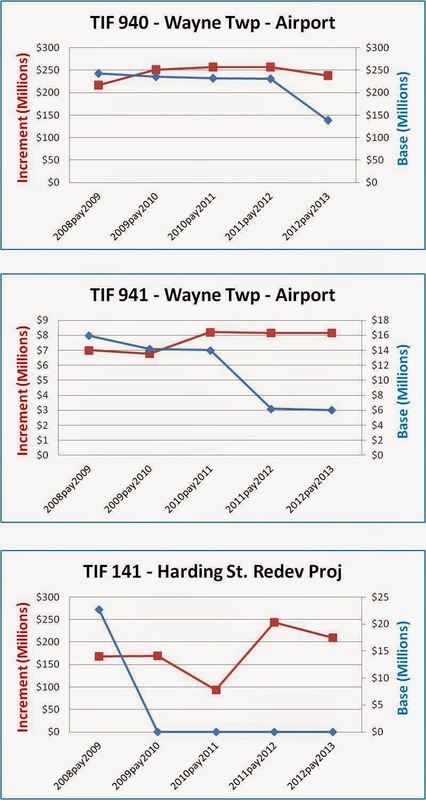 What priorities has Mayor Ballard-Vaughn actually placed on his spending of tax dollars? 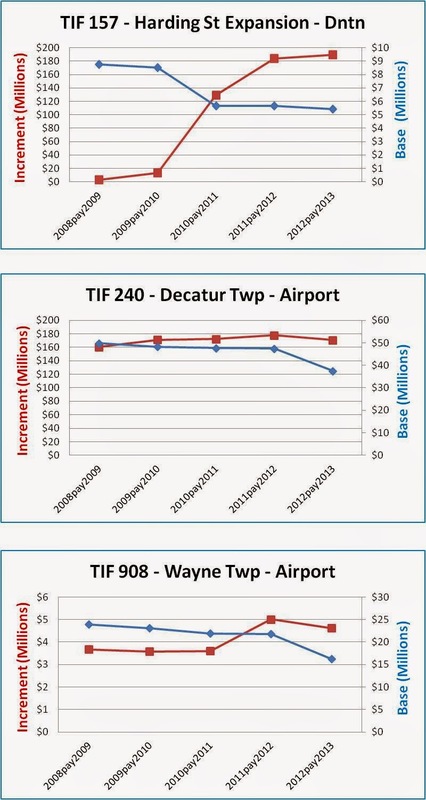 Below are two charts comparing the actual budget numbers for some City Departments and Municipal Corporations for 2014. 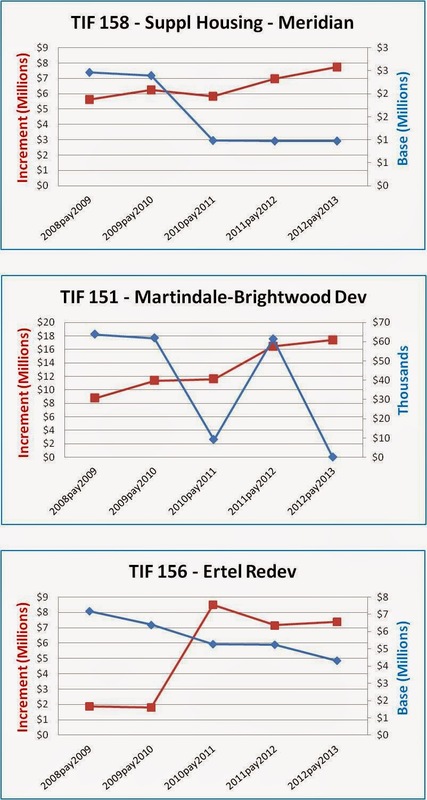 First is a comparison of several Municipal Corporations as well as the collective revenue from Marion County's TIF districts. 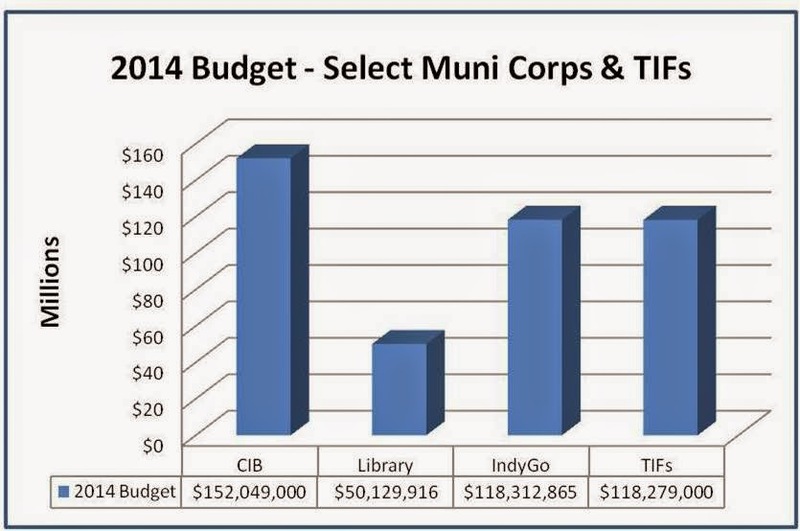 The total budget for all Muni Corps is nearly that of the entire City-County budget ($955 M vs $1.0 B). You will notice that our elected officials value sports as much as they value the current IndyGo and public Library combined. The slush fund that TIFs provide, of course, also rivals the basic public service spending that I thought City government was supposed to provide. 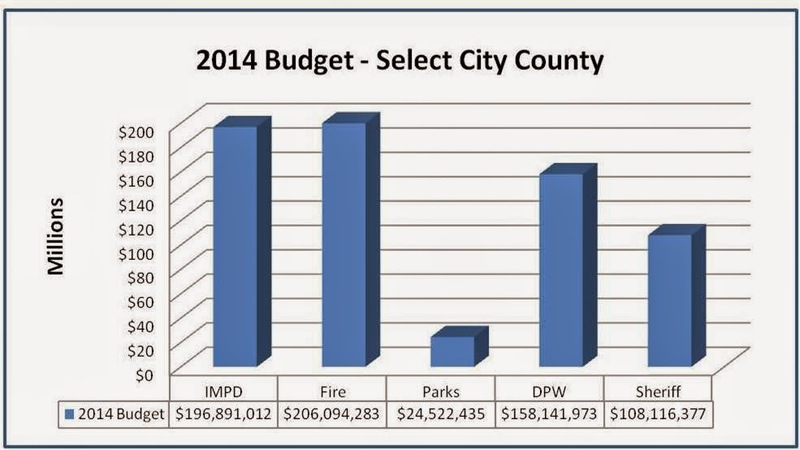 The chart below compares spending on different departments included in the City's annual budget. The Fire numbers include the fire budgets for the three Townships that still operate their own departments in addition to IFD's budget. The Parks budget number shown below also includes money Ballard has moved into DPW's budget. DPW's budget number has the Parks money removed. Elected officials give a little more priority to police and fire than they do sports, but not substantially more. Parks has been gutted by this Mayor. 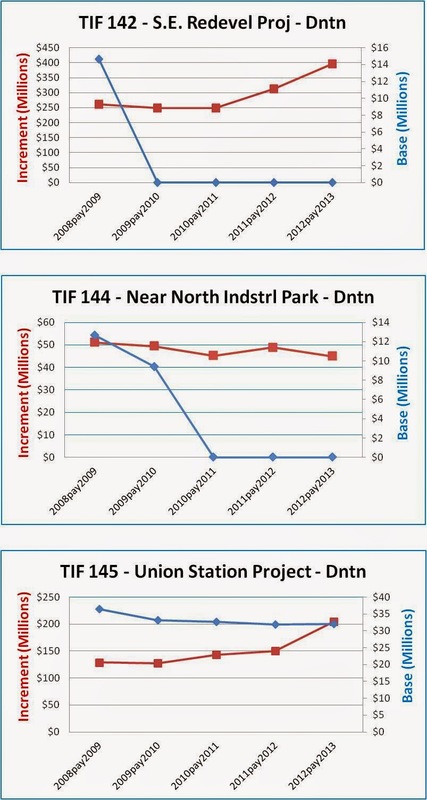 In fact, Ballard-Vaughn's proposed RebuildIndy 2 program would spend just about as much on painting bike lanes as he budgeted for all parks in 2014. When an elected official talks to you about his or her priorities, ask them how they are really spending our money. Here are the latest Administrator Approvals listed in the Citizen Access Portal on the DCE webpages. There is now a description of the project involved with the administrator approval petition, which I am including below. For further information, each petition number contains a hyperlink to the DCE record.